HomeThe HypeFilmDoes Black Panther’s nomination lead to a new era for the Oscars? After 90 years of Academy Awards, a superhero movie has finally been nominated for Best Picture. 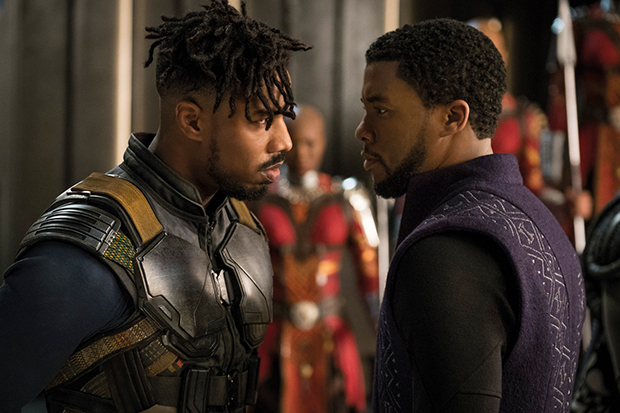 However, the nomination for Marvel’s Black Panther is not a step towards rewarding the increasing diversification in Hollywood or indicative of a move away from the trend of ‘Oscarbation,’ but a vain attempt by the Academy to placate audiences and retain viewership while still favouring traditional works. This became clear when they announced the possible introduction of a new awards category for Outstanding Achievement in Popular Film in August of last year. The award would presumably have favoured movies that have grossed over $100m and was seen as an attempt to prevent more commercial productions from pushing into the big leagues and taking home accolades in the best picture and best screenplay categories, further emphasising the divide between the popular blockbusters and the more traditionally good productions. After huge backlash the Academy finally decided against introducing the award but it sparked a conversation surrounding the need to find a place to acknowledge the achievements of popular films and recognise the changes in popular culture. Within the confines of the fictional African nation of Wakanda, Black Panther acknowledges and celebrates everything from traditional African society to African-American political debates, from the power and beauty of black women to the importance of preserving their cultural identity. Having evolved from a discussion about the importance of representation and diversification in Hollywood into a ground-breaking celebration of black culture, it is about more than the latest superhero’s journey but points toward a future where this journey of black culture is immersed in everyday life. However, despite receiving universal critical acclaim and grossing $1.23 billion worldwide, the hope that this was finally a film that could unite the elite snobs of the Academy with the masses was shattered when director Ryan Coogler was overlooked for Best Director and with his co-writer Joe Robert Cole was disregarded in the Best Adapted Screenplay category. Having received a total of six nominations, missing out on these categories may not seem like a snub however, unlike any of the other contenders for Best Picture, all of its other nominations are in the technical categories, including production design, costume design, sound editing, showing an apparent lack of belief in Black Panther’s storyline and overall message. However, given that the most-watched Oscars ceremony ever aired 20 years ago, when Titanic won the award for best picture and similar peaks occurred with the nomination of the blockbusters Avatar in 2010, Gravity in 2014 and Moonlight in 2016 the need to include popular film in the ceremony is palpable. With last year’s Oscars acquiring the lowest ratings to date with just 26.5 million viewers, making Black Panther the ‘token black film’ of the year is a convenient way to lift their ratings and take a step back from the #OscarsSoWhite image. As a strong contender in the technical categories Black Panther has the potential to have a very successful Oscars without ever winning the award for Best Picture. By engineering the nominations in this way it does not foreshadow a change in the Academy considering more popular films for this award, but allows them to maintain a façade of inclusivity while allowing them to retain the most prominent accolades for more traditionally worthy Oscar films. The Academy Awards will air on February 25, 2019 and Coogler’s film will be joined in the best picture category by BlacKkKlansman, Bohemian Rhapsody, The Favourite, Green Book, Roma, A Star is Born, and Vice.